Edison awards 30 high school seniors $40,000 scholarships every year to help them pursue their passion for science, technology, engineering or math studies. 2019 Edison Scholar David Pulido hugs his dad after learning he's a 2019 Edison Scholar. 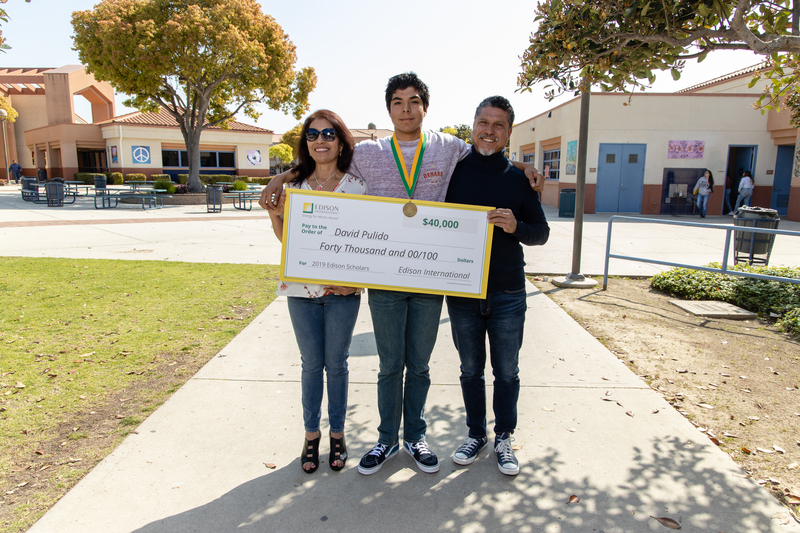 David Pulido, a senior at Oxnard High School, is a 2019 Edison Scholar. David Pulido, 2019 Edison Scholar, with his mom. David Pulido, a senior at Oxnard High School, holds up his 2019 Edison Scholar medal. Photo Credit: Courtesy of David Pulido. 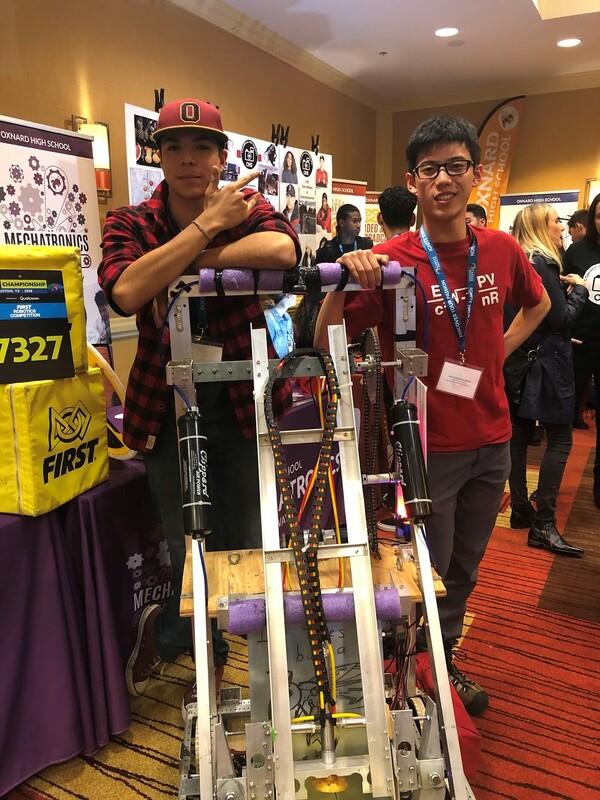 David Pulido (left), 2019 Edison Scholar, participates in a robotics competition. Chris Thompson, SCE vice president, presents David Pulido with a 2019 Edison Scholars scholarship. David Pulido, 2019 Edison Scholar, with his parents. David Pulido has always liked to play with electronics, build things and fix them. He even helped his Oxnard High School Robotics Club build a robot for the robotics team’s first national competition this year. The robot can pick up 12-inch diameter rubber balls and place them on shelves at a variety of heights and close the hatch panels so they won’t fall out. “It’s very agile, very fast and we’re extremely proud of it,” David said. David Pulido, 2019 Edison Scholar, participates in a robotics competition. Photo courtesy of David Pulido. Electrical engineering seemed like the perfect choice for his college major. “It had everything I was looking for and was going to be the best of everything that I would ever want,” David said. 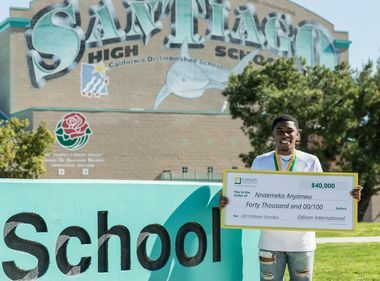 The high school senior’s dream got an unexpected boost at school recently when he was presented with a $40,000 Edison Scholars scholarship. 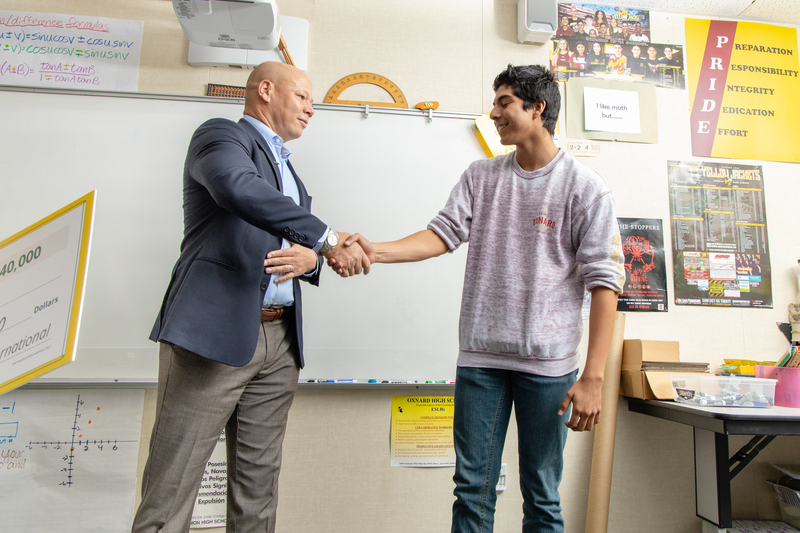 Chris Thompson, SCE vice president of Local Public Affairs, presents David Pulido with a 2019 Edison Scholars scholarship. 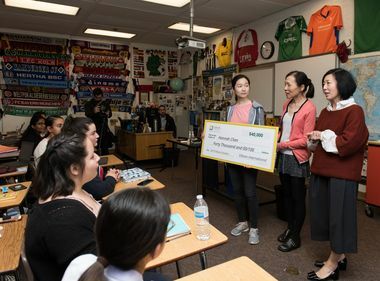 Every year, Edison International, SCE’s parent company, awards 30 high school seniors in its service area $40,000 scholarships paid over four years to help them pursue their studies in science, technology, engineering or math. Including this year’s scholars, Edison has given $9.9 million in scholarships to 640 students since 2006. 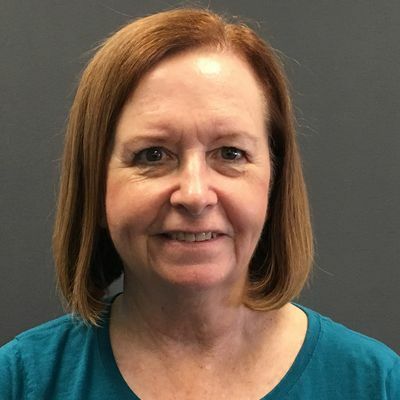 To qualify, the recipients must have at least a cumulative 3.0 GPA, show financial need and plan to pursue studies in science, technology, engineering or math (STEM) at a four-year accredited college or university. So far, he has been accepted to eight colleges and hopes to attend the University of Michigan in Ann Arbor because of the school’s strong electrical engineering program. David said the scholarship is a way for him to give back to his family for their love and everything they have done for him. Dreams of college haven’t, however, stopped his electrical curiosity. He currently is working on a portable air sensor based on Bluetooth technology and the coding language he learned for a micro-controller and some parts he got on Amazon. And the 17-year-old’s dreams don’t stop with college. 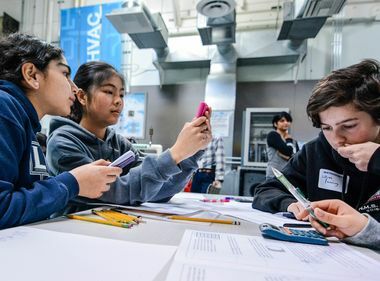 “In 10 years, I can see myself working for a corporation or perhaps on my own and doing what I want to do, which is working on microelectronics, shrinking down existing technology and improving the world and everyone in it,” he said. The Edison Scholars Program is funded by Edison International shareholder dollars, not ratepayer dollars. For more information about STEM internships and careers at SCE, visit: edisoncareers.com.